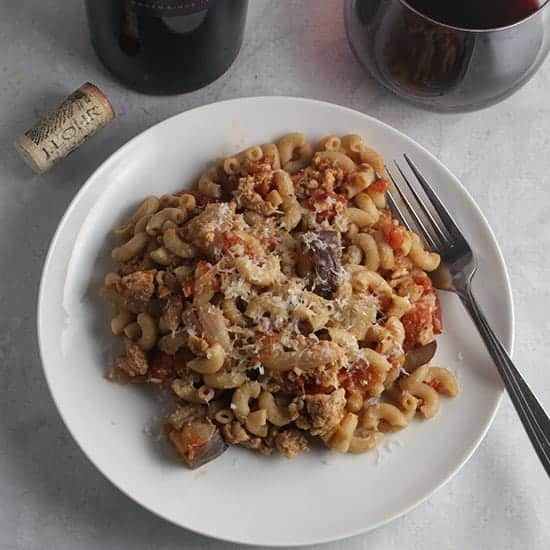 Tomato and Eggplant Pasta with Turkey is a hearty and healthy pasta dish, delicious paired with a good Merlot wine. We made it with ground turkey, but you could definitely swap in some leftover turkey from your Thanksgiving feast! The J. Lohr wine was sent as a courtesy sample as part of the #MerlotMe month promotion with our Wine Pairing Weekend group. Here’s another dish that started with the wine. With a generous supply of good Merlot on hand, thanks to the Wine Pairing Weekend blogger partnership with the #MerlotMe month promoters, I’ve been on the lookout for recipes to pair with Merlot. Tomatoes and eggplant seem to feature prominently in anything I’ve read about foods that pair with Merlot. A tomato and eggplant pasta sauce recipe seemed like a natural. Consulting with The Wine Lover’s Cookbook I added rosemary and ground fennel to the sauce to further set up a good pairing. I probably could have stopped at tomato and eggplant pasta for a vegetarian dish, but I decided to add some ground turkey to the mix for protein and substance. The result was a very hearty yet healthy pasta recipe…that paired well with Merlot, of course! Speaking of turkey, with Thanksgiving fast approaching, I would think you could swap the ground turkey here for leftover roast turkey. Just add the leftover turkey about 10 minutes before serving so that it can get warm and absorb the flavors. Up until recently, eggplant was on the very short list of vegetables I don’t like. But then I figured out it was a matter of preparation. I found like eggplant grilled or roasted, as in this Quinoa with Grilled Eggplant, Spinach and Feta recipe. There is some debate about it, but I definitely support the idea of salting eggplant before cooking. The process reduces the potential for the eggplant to come out bitter or soggy, as explained in this article. For today’s Tomato and Eggplant Pasta recipe, I browned the eggplant in the skillet before getting going on the rest of the sauce. I got the idea and method from this recipe on Chowhound. 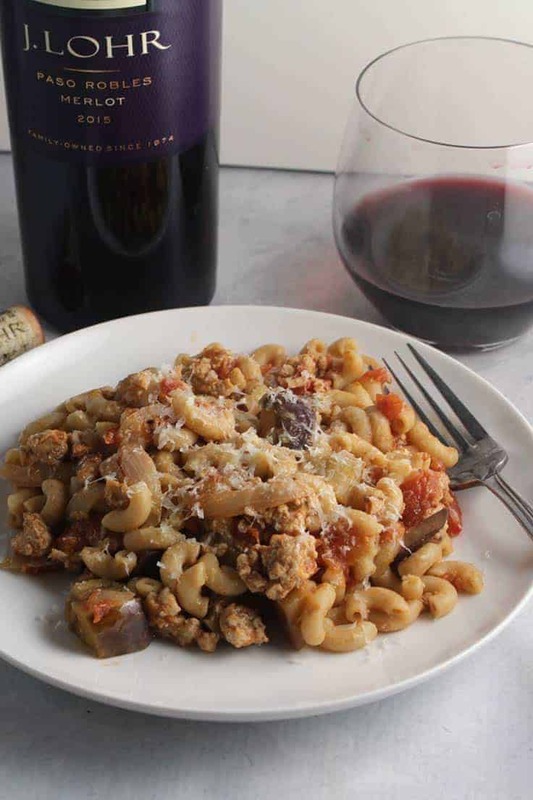 We opened the 2015 J. Lohr Los Osos Merlot ($15, 13.9% ABV) to pair with our Tomato and Eggplant Pasta with Turkey. We’ve enjoyed J. Lohr Chardonnay quite a few times over the years, but I don’t recall having previously sampled their Merlot, so was looking forward to trying it. I get the aroma of a forest floor from this J. Lohr Merlot, with taste of blackberry, chocolate and notes of cedar. Velvet mouthfeel with a nice finish. A very good wine for the price! Does the Merlot work with the Tomato and Eggplant Pasta? To be honest, my instinct would be to pair this pasta dish with an Italian red wine. Sure that’d work, but the J. Lohr Merlot worked very nicely here. The Merlot grape does seem to have an affinity for eggplant, and has just enough acidity to work with the tomatoes. The rosemary and fennel herbs definitely help here, too. So next time you are going for an Italian dish featuring tomato and eggplant, I’d say give it a try with a good Merlot! This J. Lohr Los Osos Merlot is made with grapes from the moderately cool El Pomar district of Paso Robles. The notes from the winery mention they use some Italian clones of Merlot; I wonder if that could further explain the way this worked well with this pasta dish? This Merlot has 9% Malbec in the mix, helping to bring forth bright fruit tones. For more on this wine and J. Lohr Estates, visit the winery website. Interested in more pairings for Merlot? Check out our Pork Tenderloin with Blackberry Merlot Sauce, which has links to the other Wine Pairing Weekend pairings. 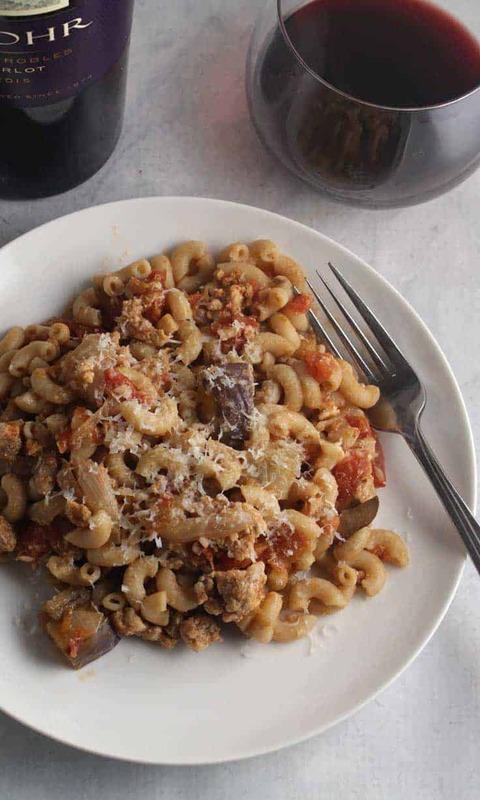 Eggplant and ground turkey simmer in a tomato sauce for a hearty and healthy pasta meal. Excellent paired with a good glass of Merlot. Cut the eggplant into a medium dice. Place eggplant in strainer, and sprinkle salt over the eggplant, tossing gently so all the eggplant is coated with salt. Put a bowl on top of the eggplant to gently press down without crushing the eggplant. After 20 minutes of salting the eggplant, blot it dry with a paper towel to remove salt and excess moisture. Add 5 tablespoons olive oil to a large skillet and heat on medium until it begins to shimmer. Add the eggplant in a single layer and cook for 5 minutes undisturbed. Stir, and continue to cook the eggplant for about 8 more minutes, stirring occasionally. When the eggplant has browned, remove it with a slotted spoon to a bowl and set aside. Add the final tablespoon olive oil to the skillet, and heat on medium. Add the onion, cook for 5 minutes until it begins to soften. Add the garlic, cook for another minutes. Add the turkey to the skillet, breaking it up with a heavy spoon. Stir it to combine with the onions. Cook until it begins to turn white, about 5 minutes. Stir the tomatoes into the skillet, followed by the eggplant. Add the fennel, rosemary and balsamic vinegar, stir to combine. Simmer the sauce on medium low, stirring occasionally, for about 20 minutes. Meanwhile, as the sauce simmers, cook the pasta according to package instructions. Drain the pasta when cooked, and toss immediately with the pasta. Enjoy with a glass of Merlot or an Italian red wine. Thanks for your tip in adding some salt on eggplant before cooking to reduce sogginess or bitterness. Never thought about it. that plus grilling or roasting turned around my opinion on eggplant! I am always wondering what new thing I can do with eggplant. Love this pasta and tomatoes recipe. It sounds delicious! Thanks Ginny! I’m definitely going to add this to my regular rotations. This sounds like a wonderful turkey weeknight meal! Pasta is always a great choice. And, of course, so is merlot! I highly recommend this Merlot! One of the best wines at the $15 & under price point I’ve had in awhile. the turkey does give nice substance. sounds like you would definitely enjoy this, given those likes! I love that you’ve used turkey. This is going to be a part of my fall meals list. Thank you, David! Thanks for stopping by, Jill, definitely worth a try! Oh my you have me. Seriously a Merlot fan as well. Food+Wine, yes I’m in. This will be on the menu for dinner tonight. Thanks for this post. Thanks Amelita, hope you enjoy it!